Most people say you won’t think about your tailbone until you’ve hurt it, and then that’s all you’ll think about. When someone stands up or sits down, their “sitting bones” which include the coccyx, will rotate out and in as necessary to balance and support the body. Sitting for extended periods on hard chairs can cause irritation in the area, causing everything from a simple bruised tailbone to sciatica flares and more. The pain from simply sitting on a regular chair can impact everything from continuing to sit to walking, bending over, and other motions you can’t get by without doing. Think of how long you sit or stand at a job, or during a movie, and then imagine being in pain the whole time! And for those confined to a wheelchair the pain can be even worse. 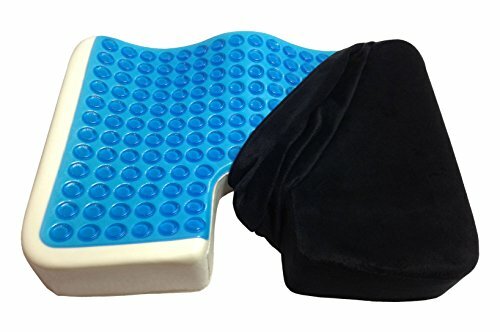 A simple way to alleviate pain from many spine conditions, whether they’re chronic or temporary, is to use a cushion specifically designed to support your tailbone, commonly marketed as a coccyx cushion or tailbone pillow. Let’s take a look at some of the most popular options around for this kind of seat enhancement. With some memory foam pads, users will find that their cushion flattens out too much to provide any padding anymore. 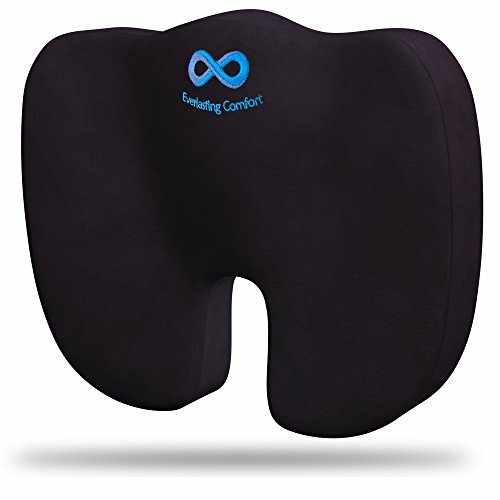 Everlasting comfort’s coccyx pillow, however, is rated for users up to 300lbs, making it more resilient that a lot of the competition and more than adequate for the vast majority of users. The removable slip case is a very nice feature for both keeping the surface that contacts your skin clean and ensuring the longevity of the pillow inside, plus it’s got a nonslip rubber base. The slipcover design deserves a lot of praise, it’s invaluable to have your cushion stay where you need it to be to relieve your pain. The dense memory foam gently cradles you and removes pressure from your tailbone, helping relieve sciatica and other back or lower back related chronic pain, and it is portable enough to be taken with you from your home to the car to the office. 17.5” Width x 13.5” Depth x 2.8” Thickness. Recommended for weights from 100 to 300lbs. Higher than average weight tolerance for a memory foam product. Not usable for anyone over 300lbs, unlike some gel tailbone pillows. The density of the memory foam makes this pad unusable on already soft surfaces, such as a couch or recliner. 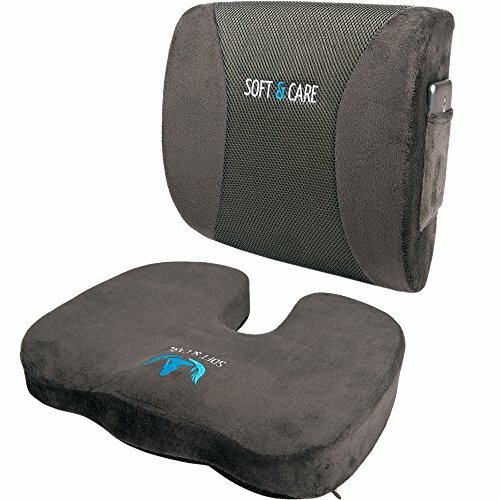 Most users will find that this tailbone pillow relieves their pain and increases their comfort in most situations, and the unrivaled density of the memory foam alongside the perfectly designed removable cover puts the Everlast Comfort pillow at the top when it comes to comfort, longevity, and ease of use. 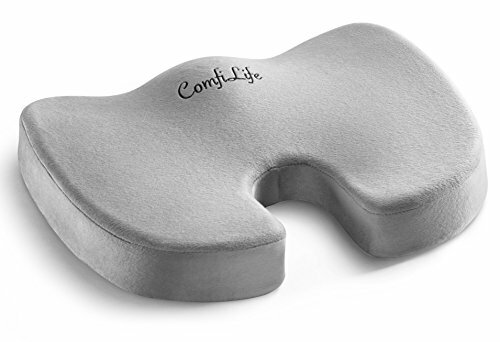 When portability is a required feature, ComfiLife’s coccyx cushion comes to the rescue. Equipped with a convenient carrying handle and weighing in at only 1.3lbs, few other pillows are as light and easy to maneuver. That makes it fantastic for the person whose job takes them all over town, or perfect for a second cushion that is always moving with you while a heavier one stays at home on your favorite chair. As mentioned above, few pillows can boast such a low weight, making this an above-average cushion for those who use public transport or who move from seat to seat frequently during their day. The weight trade-off doesn’t sacrifice any of the tailbone-saving features expected of a coccyx cushion for those who are on the lighter side. 17.7” Width x 13.7” Depth x 2.8” Thickness. Low density foam compared to others in the same price range, resulting in more flattening and a shorter lifespan. 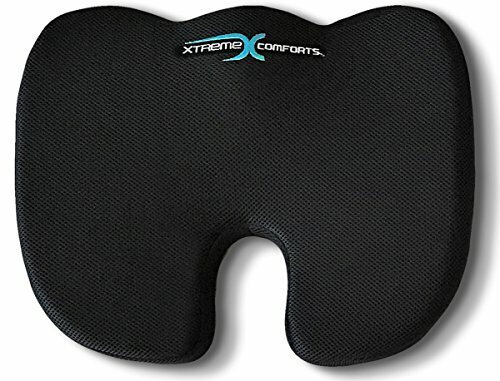 If you absolutely must have a coccyx pillow that is as portable as possible, or if you’re looking for a second pillow solely for travel, this is a very solid option. If you intend to use this pillow for extended periods of time and/or are on the heavier side, you may want to look into a denser pillow because this one tends to sink fairly quickly. A nice middle ground in terms of memory foam density, and therefore weight, this cushion stands apart with its two years, no questions asked return policy. If you don’t like it or if you find it’s compressing flat when you sit on it, you can return it! Confidence like that in a product is great to see, and translates to peace of mind for the consumer. No more worrying if you got the right product on the first try! Comfort for your body is met with peace for your mind in this package, the ability to try the cushion for up to two years is incredible. This would be a great first pillow for anyone who has yet to decide if one of these is what they’ve been looking for, you really can’t go wrong! 17.6” Width x 13.2” Depth x 3.1” Thickness. 2 year, no questions asked return policy. The proprietary memory foam used claims to deform much less than competitors. Less grip on the non-skid than some competitors results in more adjustments. Proprietary foam takes a while to soften when you first sit down. Because of the advertised return policy, it’s hard not to recommend this pillow as a first for anyone who hasn’t tried one. While this coccyx cushion does demand some patience due it’s very firm, exclusive foam, the durability supplied may be worth the trade off for many users. More than just a tailbone cushion, this set also comes with a lumbar support pillow that can strap to just about any chair you could need it on, from your car seat to the kitchen table. However, a total weight of only 2.38lbs between the two cushions makes it pretty clear that density is lacking, and the cover material feels and looks a little bit low quality when compared to some other cushions in this price range. The addition of a lumbar pillow is a great idea, it meshes perfectly with the tailbone pillow to improve posture and comfort when sitting for extended periods of time. Most, if not all, people who need to sit at work should really have both of these on their office chair. 18” Width x 14” Depth x 3” Thickness for the coccyx cushion, 13” Width x 12 ½” Height x 4” Thickness for the lumbar pillow. The most recommended ergonomic pillow combination. Two complimentary ergonomic pillows in one convenient package. Removable covers on both pillows for cleanliness and a long life. A pocket on the lumbar pillow is nice, you can never have enough pockets. Very low density, these pillows flatten quite quickly. Everyone loves a combo unit, and the idea of this particular one is great. However, the execution is lacking. Most people will find that these are just not dense enough to support them for the period of time they need. Points for promoting perfect, doctor recommended ergonomics though! PREMIUM SOFTaCARE SEAT CUSHION WILL HELP YOU with all hard surface - CHAIR in Your OFFICE, CAR SEAT in Your car, DESK CHAIR in Your home, AIRPLANE SEAT in Your plane 🙂 - it's best flight seat cushion. BACK SUPPORT PILLOW will help great on most SEATS. Cooling gel is always a welcome addition in my book, it adds just the right amount of rigidity and prevents getting hot and sweaty, and it’s as welcome as ever in a pillow you sit on! Expect all of the benefits of ergonomic cushions here, but despite the “cool” addition of gel, this is a fairly bare-bones pillow. For those in a hot climate or who sit for a long time, cooling gel’s contribution to comfort cannot be overstated. While being cool isn’t the exact comfort goal of a tailbone cushion, it fits in with the general theme well and is more than welcome. 18” Width x 14” Depth x 3” Thickness. Memory foam with cooling gel. Dense memory foam and gel combo make for extreme comfort. One of the heaviest cushions around, this is not your best bet if you want to travel around with and use the same cushion at a variety of places. While this product from Kieba is perfect for any long-term sitting you’ve got on your agenda, it is also more than twice as heavy as other pillows on this list, relegating it to a single chair more practically than to your travel needs. If you’ve just got one seat in mind, this is a superb option, otherwise you may want to look at something a little lighter, maybe even with a handle!